This question that was asked by some when the Padres announced their largest-ever free agent signing of third baseman Manny Machado to a 10-year/$300 million contract. While intended as a joke, this question reminds us that there is always truth in humor, and it points to one of the Padres’ most glaring needs as they head into 2019. This is the second of a three-part series that previews San Diego’s upcoming season (part one can be read here). As of right now, Joey Lucchesi is the Padre ace. He owns all of 26 major league starts, and 130 innings—an average of five innings per start. Next is Eric Lauer (6-7, 4.34 ERA). Both are talented, but at this stage of their careers, they are hardly the kinds of pitchers you would want to anchor your starting rotation. Robbie Erlin could earn a spot, but last year, he was far better as a middle/long reliever (2.05 ERA, 0.79 WHIP in 27 games) than as a starter (6.23 ERA, 1.456 WHIP in 12 starts). After a strong major league debut against Philadelphia, Jason Nix often looked overmatched (2-5, 7.02 ERA, 1.54 WHIP in nine starts). 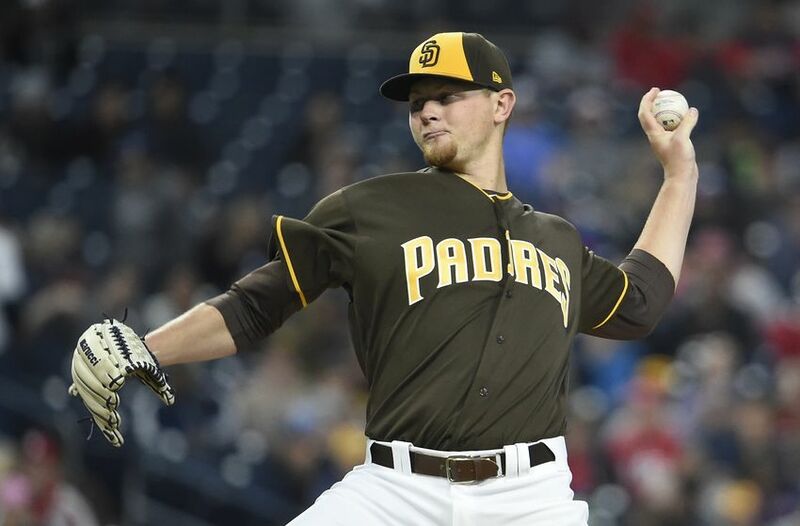 Logan Allen and Cal Quantrill finished last season at Triple-A, and they could both compete for a slot, as might Chris Paddack—who might even be the opening day starter—and reliever Matt Strahm. Bryan Mitchell (5.42 ERA, 1.75 WHIP including 43 walks in 73 innings) and Luis Perdomo (7.05 ERA, .328 BAA) were also terrible, and have not impressed this spring. 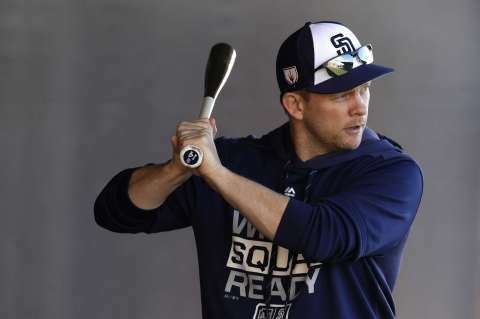 It is also concerning that manager Andy Green lacks a competent right-handed starter with some big league experience and success. Unless A.J. Preller signs Dallas Keuchel or Gio Gonzalez, or trades for someone like Trevor Bauer or Marcus Stroman, the 2019 Padres will struggle to reach .500, let alone contend for a playoff spot. When Preller signed Eric Hosmer to play first base 13 months ago, it was (then) San Diego’s largest free agent signing. Fans had some buyer’s remorse, especially when he hit just .253 (his lowest BA since 2012), struck out a career-high 142 times, and batted a paltry .179/.240/.287 against lefties—lifetime, he is .253/.300/.369. Hopefully, Hosmer will bounce back—and he does have a propensity for doing so in his career. Plus, he is a good clubhouse presence. But if the baseball world was shocked by Hosmer’s signing, it was bowled over when Preller outdid himself be penning Manny Machado to a ten-year deal. We all know the pro’s for signing Machado: he is 26, he fills the Padres’ biggest black hole at third base, and he is a once-in-a-generation ballplayer. That said, here are the con’s: he was accused of dirty and lackadaisical play in last year’s playoffs with the Dodgers, and his “Johnny Hustle” comment did not win him any fans. Though he has addressed this comment, Machado has to show that he is better than what viewers saw last October. Padres management is hoping that personalities like Hosmer and Ian Kinsler will rub off on Machado, but time will tell. Lastly, there is Wil Myers. While he is owed just $5.5 million this year, his salary will skyrocket to $22.5 million from 2020-22, followed by $20 million in ’23, or a $1 million team buyout. At this point, he simply has not lived up to his 2016 season (28 homers and 28 steals), and last year, he only played in 83 games. Why does all of this matter? The Padres are a smaller market team that the Dodgers, Yankees, Red Sox, and others. So when they do splurge on big contracts, they have less margin for error than those other teams. Great wisdom is needed here. Hopefully, Machado’s signing will change the trend of bad contracts (Cameron Maybin, James Shields, Jedd Gyorko, Matt Kemp, etc. ), but we won’t know for certain until at least mid-season. Coming into 2019, the Padres had six outfielders vying for three starting spots. Before spring training, it was announced that Myers was going to patrol left field (more on this in a moment). Hunter Renfroe or Franmil Reyes will also play the corner outfield slots. 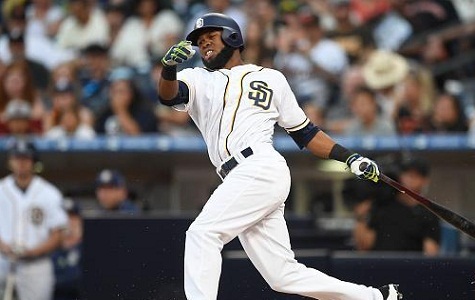 That leaves Manuel Margot, Franchy Cordero and now, apparently, Myers vying for playing time in center field (Jankowski figured to get some playing time there, but he is sidelined until the summer). After a promising rookie season (.313 OBP, 17 steals, 13 home runs at age 22), Margot regressed badly last year (.292 OBP, 11 steals in 21 attempts). Since he profiles as a leadoff hitter, he must improve on those stats, or risk becoming the next Thomas Howard. Cordero, 24 is another possibility, but right now, he has four things going against him: he has not yet learned how to unleash his raw potential, he missed valuable development time when he injured himself last May (and missed the rest of the season), he strikes out way too much, and he is not the defender that Margot is. But now, there is talk that Myers could be making a return to center field, though how much he will play the position is not certain. If that sounds familiar, it should: he was the starting center fielder in the ill-fated 2015 season, and his play there was one reason why he got bumped to first base the next season. So the three candidates to start in center are Margot, who can field but hasn’t yet shown that he can hit; Cordero, who has big talent but also some big concerns; and Myers, who really is better positioned as a corner outfielder. Here’s the bottom line: unless Margot drastically improves offensively, Cordero figures things out, and/or Jankowski recovers quicker than expected, San Diego will not have a center field controversy; they will have a center field problem. 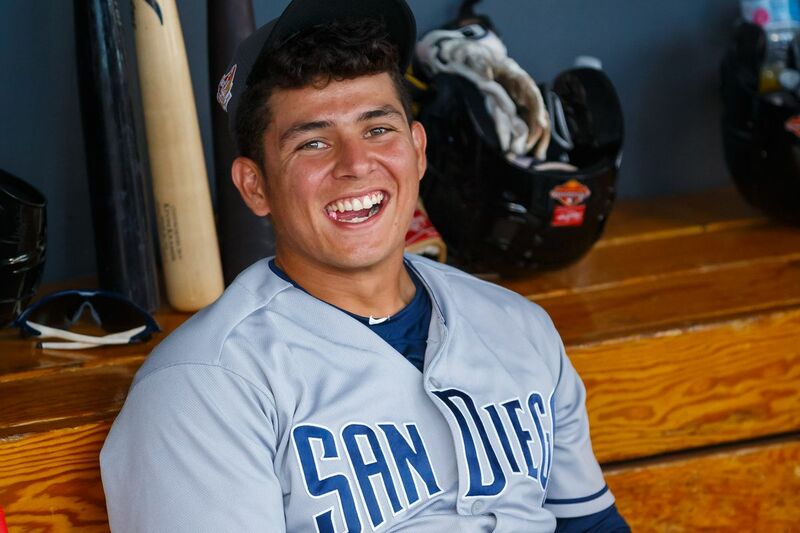 Rookie Blues for Urias, Tatis? Padres fans are rightly thrilled about their future middle infield. Next to Vladimir Guerrero Jr., Fernando Tatis, Jr., 20, is the “next big thing” in baseball. Luis Urias, 21, has an unusually good batting eye and has drawn comparisons to the Astros All-Star second baseman Jose Altuve. But while there is reason for optimism, even the best young ballplayers can get off to rough starts in the big leagues. And let us not forget that both Tatis and Urias still have hurdles to overcome: for one, both have a propensity to start slowly when they get promoted to a new level. Also, Tatis’ highest level of professional experience is 88 games at Double-A, and he has to cut down on his strikeouts. Padres management will not want to rush him, and given his youth, this is the wisest course of action. Urias started his last season at Triple-A very slowly, and he showed that he still has room for growth when he batted just .208 at the big league level (though to be fair, this was a small sample size). So while “Padreland” is rightly excited about the Tatis-Urias double-play combination, they are still quite young, and they have a lot of room for growth. While much of the Preller-produced “hot lava” talent should start to bear fruit in 2019, there are still reasons for concern—especially with the starting pitching and center field. The experts should be listened to when they say that 2020 is far more realistic than 2019 for the Padres to become serious contenders. Next time, we will take a look at how many games we should reasonably expect the Padres to win in 2019, and why. Another good article. You hit the bullseye to note all the bad contracts on Preller’s watch. This must stop. The Kinsler and Machado signings must start a new trend of smart, if bold, moves. This team does lack pitching. Signing Keuchel would be a good fit, but trading for one makes more sense, possibly from Cleveland. Trading allows us to resolve the OF situation, and clear 40 man roster spaces. Also Gonzalez has signed with NY. It’s not fair to say we must wait to evaluate Machado, he’s a great player signed for a reasonable amount. Whether he has a good first half won’t change that. Just like a good year from Hosmer won’t change that from the horrible signing it was. We must stop the Myers in CF insanity. He cannot handle the position on anything but an emergency basis. Margot is 24 and played 2 seasons in the bigs. A player shouldn’t be too firmly evaluated until they play 3 seasons OR reach their age 27 season. And with the young staff, go for defense up the middle. That means C- Hedges, SS – Urias/Tatis, 2B – Kinsler/Urias, CF – Margot. Assuming they do indeed add a pitcher, 80 to 85 wins would seem within reach. And after 3 years of underachieving Andy Green should be on the hot seat. You’re concerned, but I’m not. So Preller’s hot lava is inexperienced. That shouldn’t be a concern, since there will be plenty of innings for them to GET experience. It would be a concern if AJ got 2-3 journeymen innings-eaters the baseball writers have heard of, preventing the kids from getting their shot. Same in CF. Margot provides the defense so Franchy will have to out-hit him substantially and improve with the glove to get more than occasional playing time. 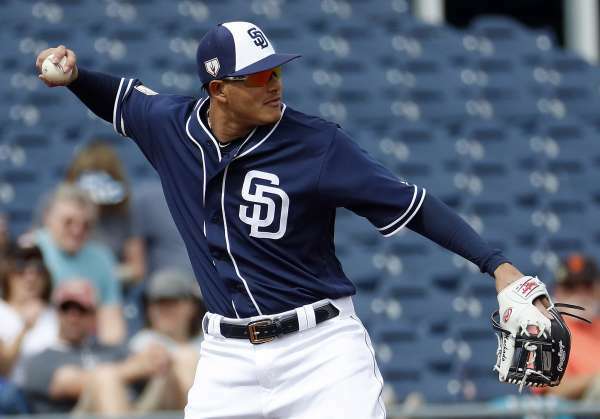 Myers has been in center only to give corner outfielders more chances to play in Peoria, and prove he doesn’t belong there in San Diego, and by golly, he did just that. That’s why I’m not concerned. This is a development year for a lot of hot lava talent, and given the number of pitchers coming up, a sink-or-swim season for several. There will be years when writers and fans alike sweat the details ahead of a tough fight for postseason play, but this isn’t one of them. The best course for the players is to stay loose, go out there, and have fun, and the fans should do the same.